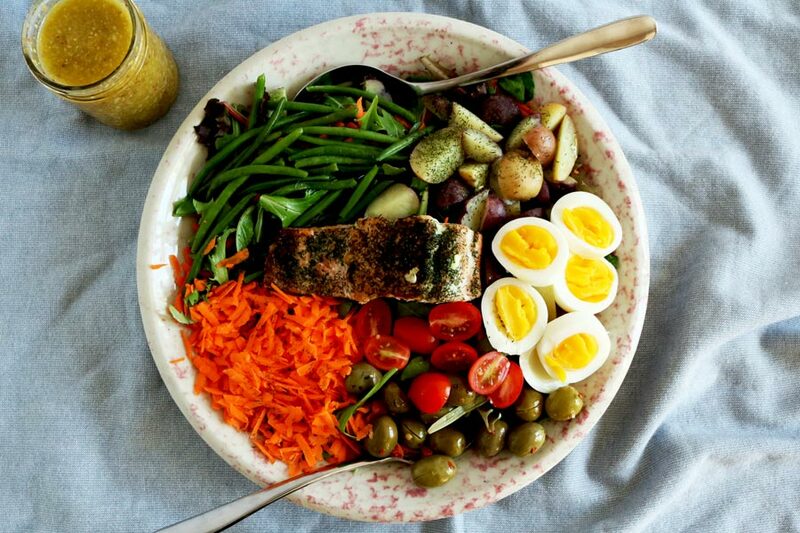 Inside Scoop: This healthy nicoise salad is a total brain booster. This recipe was submitted by Heather Allen, Holistic Nutritionist, coconut enthusiast and ukulele lady with a sweet spot for all things seasonal. Sometimes you just need a massive salad the size of life that fills your belly and heart, and keeps you full for hours. 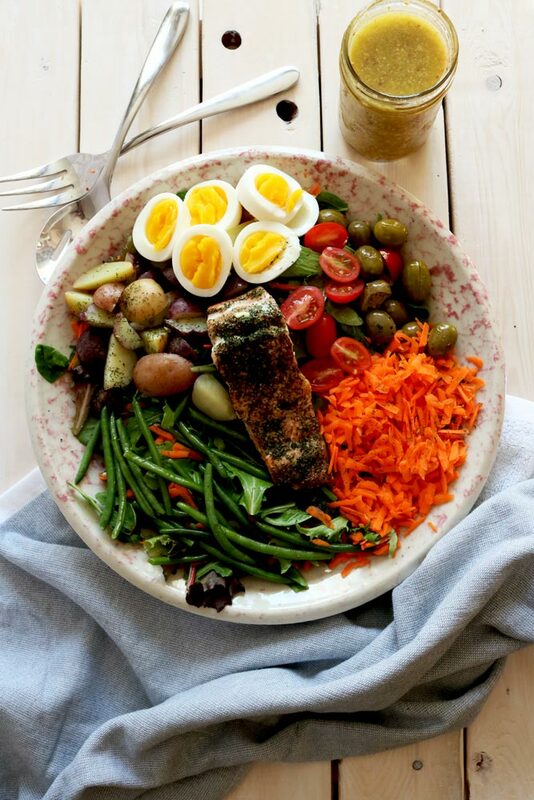 And, sometimes that salad needs to be a traditional, brain boosting, healthy nicoise salad. 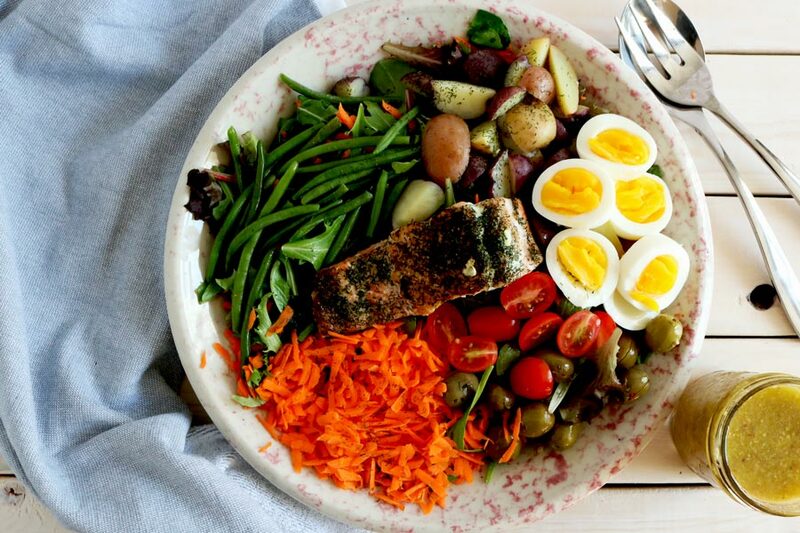 WHAT’S A HEALTHY NICOISE SALAD? Fun fact, nicoise stands for ‘in the style of nice’ and any dish labeled as a nicoise would be in the cooking style of Nice, France. These dishes usually incorporate olives, anchovies, tomatoes, and the predominant flavour is often garlic. 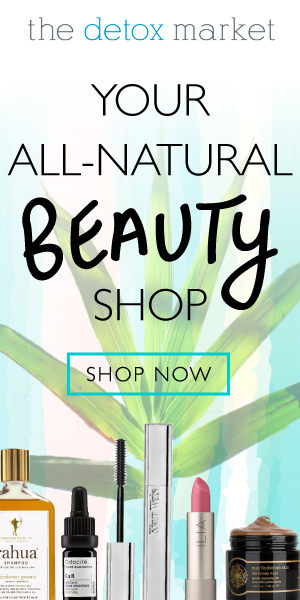 In North America you will often see a nicoise salad with tuna or a type of fish, and a lot of restaurants and cuisines use their creative culinary skills to bring you a salad that is incredibly rich in healthy fats, seasonal veggies, and delicious salad dressings. 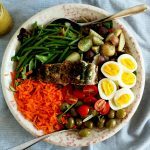 This healthy nicoise salad is a great combination of carbohydrates, fats, protein and packs a nutritional punch thanks to all the vibrant colors. 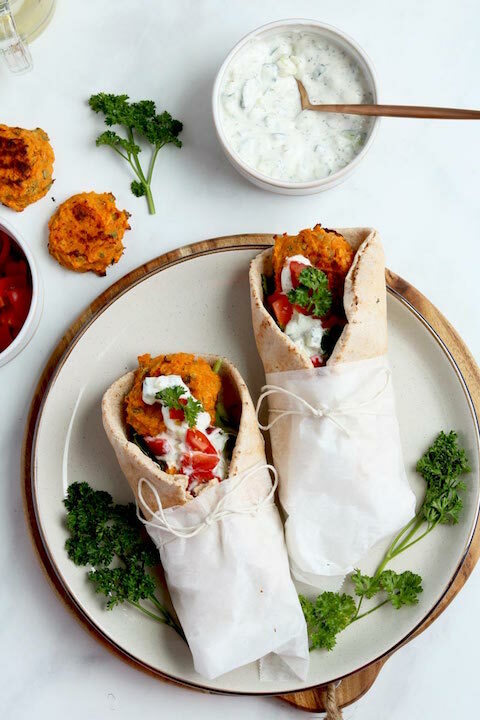 The best part: you can enjoy it in under 20 minutes and even make it ahead for fuss-free lunches. 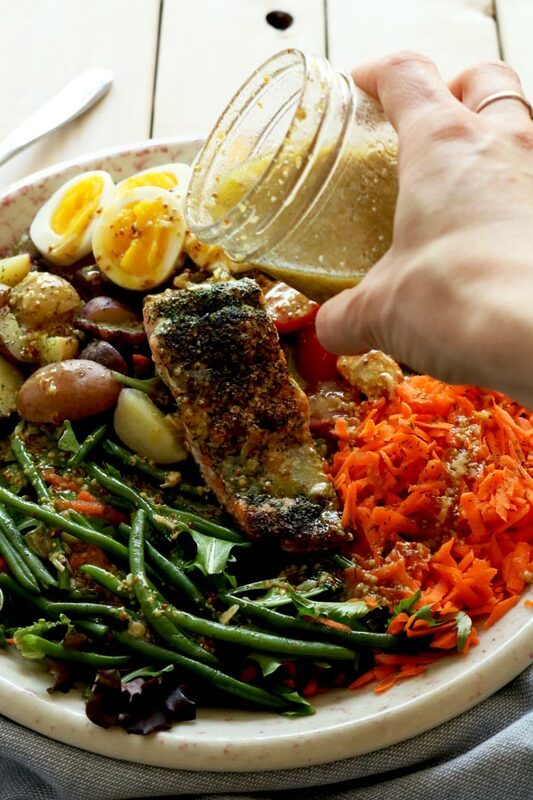 The versatility of nicoise salad recipes are just great as well! 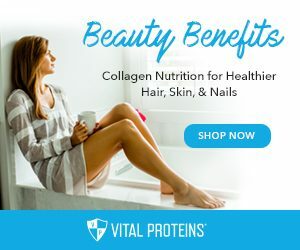 You can add in any garden vegetable that you like, root veggies, beans, all kinds of leafy greens, tomatoes, and then a full-fat fish pairs perfectly. But, with the fish you can go for a filet, seasoned well with lemon and dill, or a can of flaked tuna or salmon. Add this salad to your dinner repertoire tonight. Comment below with your favourite way to top your nicoise. And, if you’re looking another simple salad recipe that’s loaded with healthy fats, protein and fiber (in an essence, keeping you feeling full) check out this recipe for Sweet Heat Kale Salad With Shrimp. This super simple salad is a breeze to create and has some major brain boosting nutrients to keep you on top of your game. 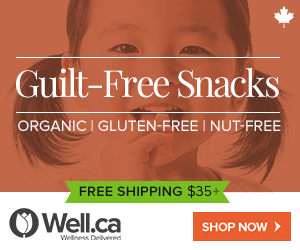 It's a perfect balance of carbohydrates, fats and protein to help you beat the mid-day slump. Pinch of salt & pepper to taste. Once cooked, run eggs under cold water and set aside to cool. 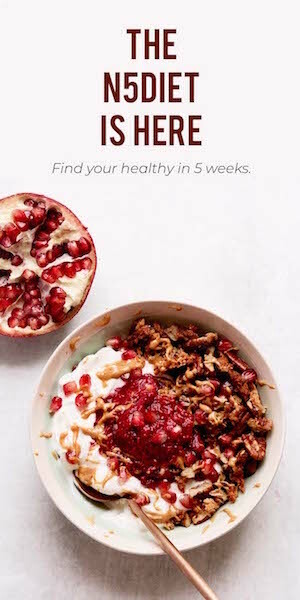 Combine all other ingredients into a large salad bowl. Once cool to touch, peel the eggs, slice into quarters and add to the bowl. Additional salad add ins: boiled mini potatoes, feta cheese, grated carrot, roasted beets Sometimes we like to add a splash of maple syrup to the dressing, and triple the batch so we have leftovers. 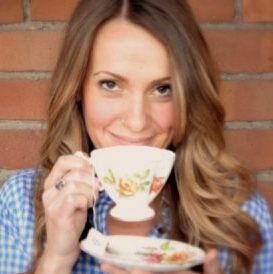 Heather is a Holistic Nutritionist, coconut enthusiast and ukulele lady with a sweet spot for all things seasonal. Heather’s passion for nutrition started during her years spent traveling abroad where she noticed first-hand the impact each new cultural diet had on her mental and physical wellbeing. Heather later pursued this passion by attending The Institute of Holistic Nutrition, where she graduated with first-class honours. 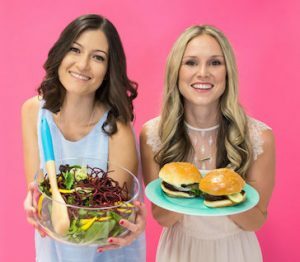 She currently runs a private practice in the heart of downtown Toronto, working alongside Dr. Meghan Walker, ND, to support the nutrition and lifestyle needs of some of the country’s top business leaders and hard-working moms.